With family photo season upon us, I’ve been working on putting together some posts to help y’all get ready. Besides questions about how to get the family ready mentally for the session and whether you should bribe your kids (that post is coming next), the most frequent question I get is about what to wear. I love helping clients through this part and usually send some tips before the shoot and help actually pick outfits if someone asks. I also have a Pinterest board full of inspiration and advice. But despite my best intentions, I’ve never put together a blog post. And while there are no hard and fast rules, there are some tried and true tips and tricks for looking your best. First things first. Just be yourselves. Wear something that makes y’all happy and feel your best. Not to mention, something that looks like you and your family. For everything from makeup to hair to clothing, keep it somewhat natural and looking like yourselves. There’s no need to be someone y’all are not. Just polish things up a bit, you know? I also tell clients not to feel the need or pressure to go buy anything (unless, of course, they want an excuse to go shopping). This can often lead you down a stressful road and why add more stress to your life. I also usually suggest that whoever is the most style-conscious person in the family picks their outfit first, then plan the kiddos and the rest of the family around them. Remember, this is just advice, won’t apply to everyone, and some rules are meant to be broken, but there are some general do’s I’ve learned over the years. Do keep it simple. Stay with a color palette of 3-5 complementary colors and mix in neutrals like denim, khaki, white, or gray for a nice balance for each look. Personally, I think neutral color palettes with a pop of color (like yellow) photographs especially well. I’ve noticed there are also some colors to think twice about, such as large amounts of true red, bright greens and blues, and neon colors. The key word here is large. In small amounts, you’re all good. Do mix things up. Everyone should look slightly different and not matchy-matchy or all wearing the same thing. Do add some accessories, layers and patterns. Small patterns of polka dots, plaid, florals, and stripes can photograph beautifully, just don’t over do it. Do add some movement. This is especially good tip for the ladies. Something that will move with you and the breeze photographs really well. Do put it all out there. Lay it all out together and see how everything looks. Then take a few pics and text a trusted and stylish friend or me/your photographer for a second opinion. Now, of course, for a few don’ts. Don’t advertise for anyone but yourselves. No big logos, text, tv/movie characters, etc, all of which can be distracting and take focus away from your lovely faces and shining personalities. Don’t just wing it. Maybe you’re one of those cool people with effortless style and can throw together some outfits last minute. But for the rest of mere mortals, skipping the planning step and scrambling the day of, doesn’t always result in the best look but usually adds unnecessarily stress. And who needs that? Don’t be too casual. While you don’t have to wear your Sunday best, family photos are a special occasion and dressing too casually is discouraged. So, please no athletic wear, or Crocs, Keens, or the like as their bright colors can really stand out and be distracting. Don’t try a new style. The week before your shoot is not the best time to try out a new haircut or makeup for the first time or wait to try on that new look or outfit. These are things to test out well before your session. Don’t forget to check the forecast. Have an outdoor session? Stay seasonal and check the forecast and plan accordingly. Don’t forget about your shoes. I tell my clients to keep ‘em cute but comfy. We’re usually walking and moving around during sessions, so keep that in mind for everyone’s comfort, as well as ladies’ heel type. For the guys, converse, casual loafers, boat shoes, leather sandals, or nice flip flops are all good choices. No need to go too dressy or athletic. Don’t be afraid to get a little dirty. You never know where your session will take you and sitting on the ground or leaning against a wall or something may make for the best shot, and you don’t want getting a little dirty to get in the way of that, now do you? My talented friend and photographer, Megan of The Penny Gray Photography Co., recently wrote an excellent post about putting outfits together that y’all should most definitely read before your session, and if you’re in the Washington D.C. area and in need of a fantastic photog, check her out. And to my clients, if you’re ever stumped and feeling stressed out, I am always here and happy to help. It may sound cheesy or clichéd, but being a family photographer is an honor and a privilege I don’t take lightly. There is so much trust that comes with capturing these precious moments. And it’s even more special when people, especially strangers, invite you into their home. Several months ago, these three sweet, kind, funny, and handsome guys did just that and I’m finally getting around to blogging their session (sorry, guys!). And thank goodness, because look at them. Could they be any cuter?! I’m so happy I could capture these tender moments at home for them. Adorable Jake had just turned one and a couple months after the shoot, the family moved to a new home. And even though time and lighting constraints meant I couldn’t photograph more of their home than I usually like to, in the end, it really didn’t matter. They still have some of those early days as a party of three at the old house captured forever. And that folks, is why I do what I do. Want your own session at home? In addition to my Fall Pop-Up Portrait Sessions, I’m also offering some special at-home sessions, so get yours today, they won’t last forever! I’m always torn between at-home sessions and getting out and about with my families. On the one hand, there is probably no place else that means more to you and your children than home, where your family’s story unfolds most, both the big and small moments. But it is definitely not the only place where your family’s memories are made and new stories are written. Especially in an outdoors-y city like Austin, many families have special spots around town that mean as much to them as their home and I love getting out there and playing and exploring with them. And after this sweet daddy and daughter session, I just want to get out there even more. Garret is good friend of mine and one of the best compliments I’ve received so far from our fellow friends has been how ‘Garret’ these photos are — meaning they reflect who Garret is, what kind of father he is (pssst, he’s pretty awesome), and how he and his daughter like to spend time together. Authenticity and love. And of course, lovely images. That’s what I strive for each and every family session. And putting together this post of some of my faves, I think I nailed it this session, if I do say so myself. Now as awesome as our friends’ response has been, by far the very best compliment was when Garret texted me after getting the full gallery and said that it made him tear up. That’s not uncommon to hear from the mommas, but I don’t hear that very often from the dads, which of course makes it all the sweeter. Want your own adventure session? In addition to my Fall Pop-Up Portrait Sessions, I’m also offering some special adventure sessions, so get yours today, they won’t last forever! Since my new Pop-Up Portrait Sessions are coming up (psst, have you booked yours yet? ), I thought this would be an excellent time to start a series of blog posts to get y’all ready. This is something I’ve wanted to do for a while but, well, haven’t. Hashtag blogging is hard, y’all. As family photo season fast approaches, I imagine there might be a few of y’all out there that are beginning to feel the first tingles of stress. Family photos are wonderful for so many reasons. Duh. Not only do they document family growth and milestones, but they help us create fond memories, too. Not just for the parents and the grandparents, but for the children, grandchildren, and generations to come. But, this day can be very stressful, too. I get it. And I want to do all I can to make sure this experience is as stress-free as possible. Because as many of longtime clients will have heard me say, if y’all are stressed and anxious it will show on your face and in your body language, and your kids will most likely pick up on it, too. We want your photos to be carefree, authentic, and full of love. So I’ve put together a little list of five tips y’all can use leading up to, and especially on, picture day to help everyone relax. Is this list also a little clichéd? Probably. Still true and helpful? Probably, and most definitely can’t hurt to try. 1. Take some deep breaths. A common relaxation method, deep breathing can quickly calm your stress level, you can do it anywhere, and is a great place to start when managing anxiety and stress. Breathe in through your nose and exhale through your mouth, counting slowly down from 10 in your head while letting it all out and taking a deep breath between each number. If you’re still feeling super stressed, repeat the process again. Another technique to relieve stress and muscle tension is to use your finger to trace a figure eight on the palm of your hand. Or before your session, try some simple stretches or yoga poses to release any tension and stress in your body. Just because these are simple techniques, doesn’t mean they don’t work. 2. Laugh. Laughter is a great way to release stress and tension. It will also help the whole family relax before the session, as well as results in genuine smiles and interactions during the shoot. I’m a big fan of the good ol’ fashioned tickle-monster or a good snuggle sesh to get those smiles and relieve a bit of stress. Still working on your stand-up? Me too. So instead of jokes, for some reason having everyone pretend to laugh feels so ridiculous that everyone ends up actually laughing for reals. These sorts of things can help to ease the family into relaxation mode before and during the session. It’s also good to remember that every photo doesn’t have to be the traditional everyone-looking-at-the-camera-and-smiling shot. It’s great to have a little variety and capture your kids being kids and reflect your family as perfectly imperfect as they are. 3. Distract Yourself. If someone is being shy, isn’t into taking pictures, is having a meltdown, or in some other way not cooperating* and you can feel your blood pressure rising, I encourage you to take a little break, maybe go for a walk or try busting out some dance moves. This will help alleviate some of your stress and the kids’ excess energy, as well as give us some good interaction shots. Another thing you can do is to simply take a step back and outta frame and let me focus on shooting other members of the family for a little bit. *I hate to use that word, as well as break it to y’all, but when there are tiny humans involved, these kinds of things tend to happen more often than not. And don’t worry, it is TOTALLY NORMAL. I promise. So please, pretty please, don’t be embarrassed, anxious, or stressed. I get it and have seen it all. Ahead of your your session, it may help to think of a short game that your family enjoys and can help relieve stress and loosen everyone up – it could be something as simple and silly as duck, duck, goose, or dancing to head, shoulders, knees, and toes, etc. Don’t overthink it and don’t worry if you don’t think of anything. 4. Lots of XOXOs. It seems too easy and obvious, right? But not only will these make for the sweetest shots, hugs are another excellent stress reliever. So gather your crew up in a big group hug or give your sweetie a kiss and I bet y’all feel some of those worries melt away. If you’ve worked with me before, you know I’m a big fan of everyone touching and loving on each other. 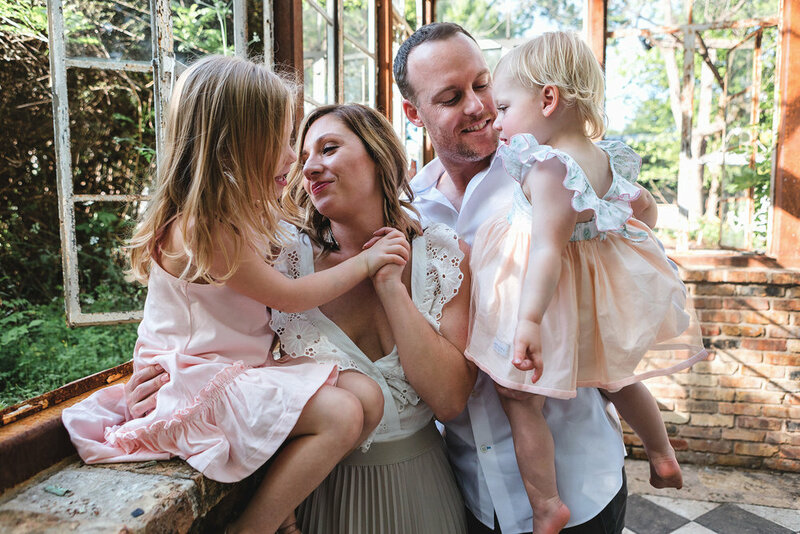 Not only do we get gorgeous images that reflect your family’s love, but it just feels good and helps everyone relax. 5. Let it go. One of the biggest stress relievers, but hardest to do, will be to try to relax and just let me take the lead. Don’t ask anyone to smile. Don’t fix anyone’s hair. Don’t point at the camera. Just be and let me do the rest. Trust my process, hand the reins over to me, take a break from the rules, and just have some fun with your kiddos. Let it all go. I plan on covering this in more depth in another post soon, so hold tight. So there y’all have it. Take ‘em or leave ‘em. But as my momma always says, it never hurts to try. And above all, please remember that I’ll be doing everything I can to help y’all relax and have a great time during our shoot. I’ll be back soon with more good stuff to help y’all get ready for your close-up’s, including tips on what to wear and the eternal question of whether ‘to bribe or not to bride’ your kids.